"A super fun and easy way to serve the usual tuna fish. Just wrap in a tortilla! My kids have been loving these for years, as I did when I was a kid. Awesome for lunch boxes, just wrap in plastic wrap or foil. The kids love calling them 'Tor-tunas'!" Mix tuna, mayonnaise, pickle relish, onion, celery, lemon juice, and garlic salt together in a bowl. Lay 1 lettuce leaf on each tortilla. Spoon tuna mixture in a line across the middle of each tortilla. Fold opposing edges of the tortilla to overlap the filling. Roll 1 of the opposing edges around the filling in a burrito-style. Delicious! 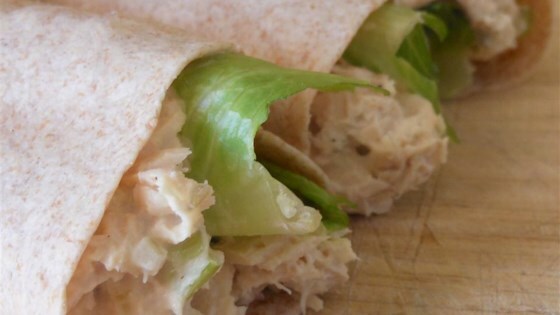 A great, simple recipe for basic tuna salad- just wrapped in a tortilla. I used albacore tuna and added a little black pepper and mustard. Great lunch! Excellent tuna salad recipe. So simple and quick to make. I will be making this one again. Another delicious way to prepare my tortillas. Fast and easy perfect for summer days and on-the-go. This is just how I make my tuna salad now. I never put them in tortillas, but it's a great recipe.